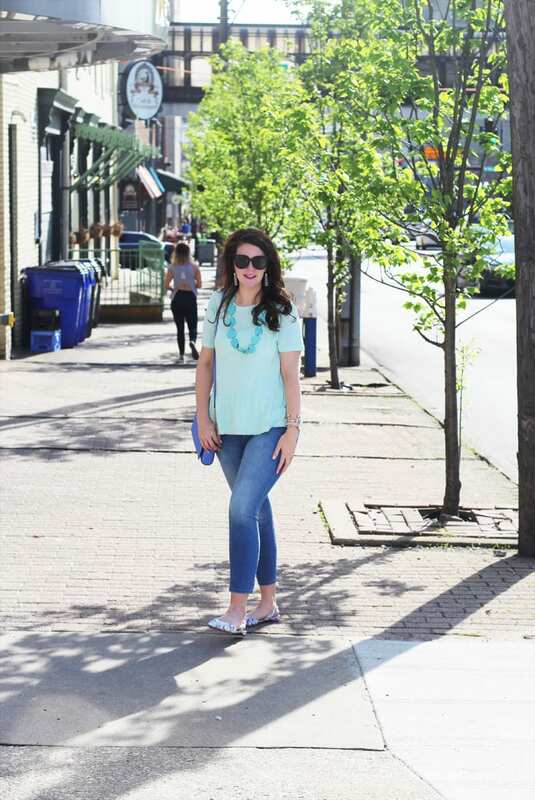 Each month, I team up with some of my blogging buddies byBMG, Della Devoted, and What Nicole Wore for the How I Style It series–we all take one style idea and each put together an outfit based on it. 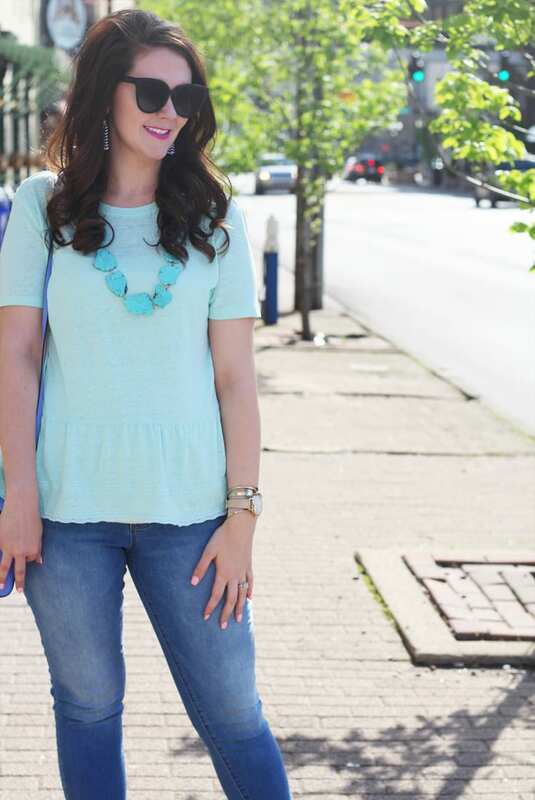 This month, the How I Style It girls have teamed up to show you how we’re styling pastels for SPRING! 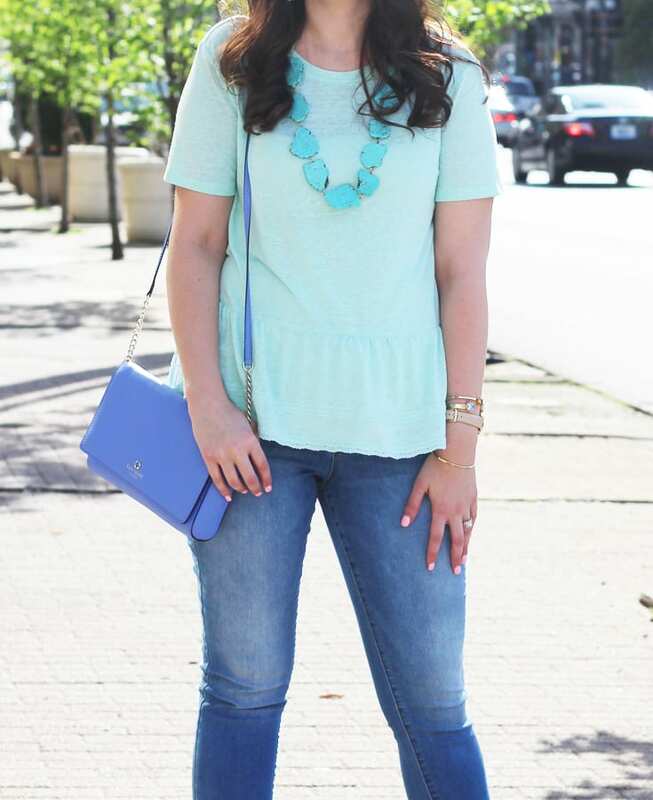 I’m not even going to lie about it–I love looking like an Easter egg in the springtime:) Which means pastels, pastels, and, oh, more pastels! Pastels look amazing on all skin tones. I love how happy the colors are. 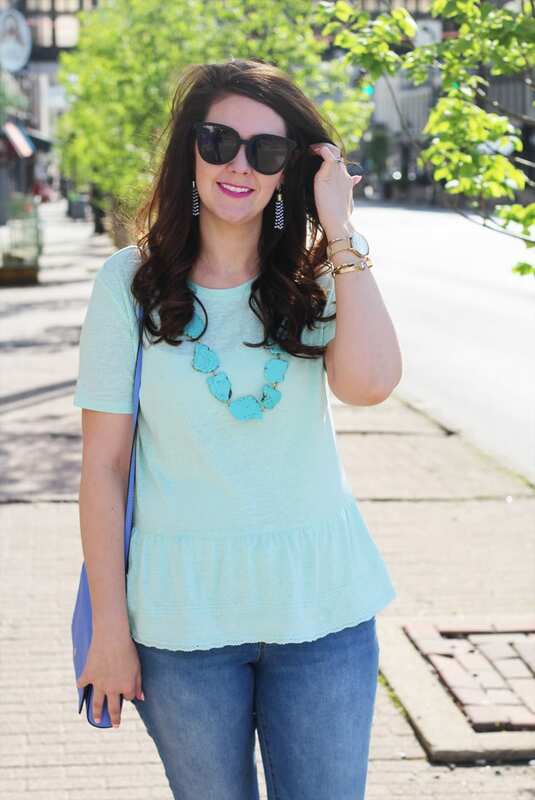 This peplum top is the prettiest shade of mint. It also comes in coral and is under $20. I paired it with my favorite lighter wash jeans. Definitely pick up a pair of light wash denim for spring if you don’t already have a pair in your closet. 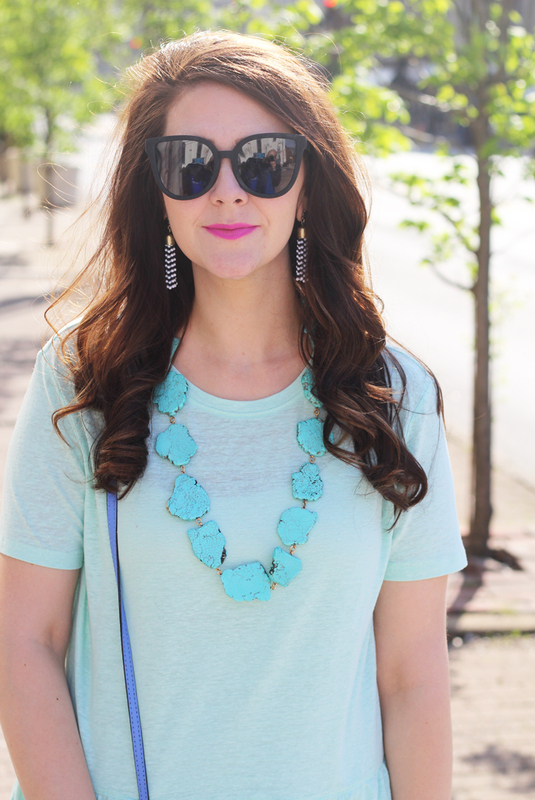 I added my favorite necklace from Purple Peridot that’s more turquoise in color to add depth to the top of my outfit. FYI, you can save 10% with code PC10. It comes in 3 colors and is a true statement necklace. I wanted to wear these new flats, but they only have light blue and lavendar shades, which doesn’t truly match my outfit. 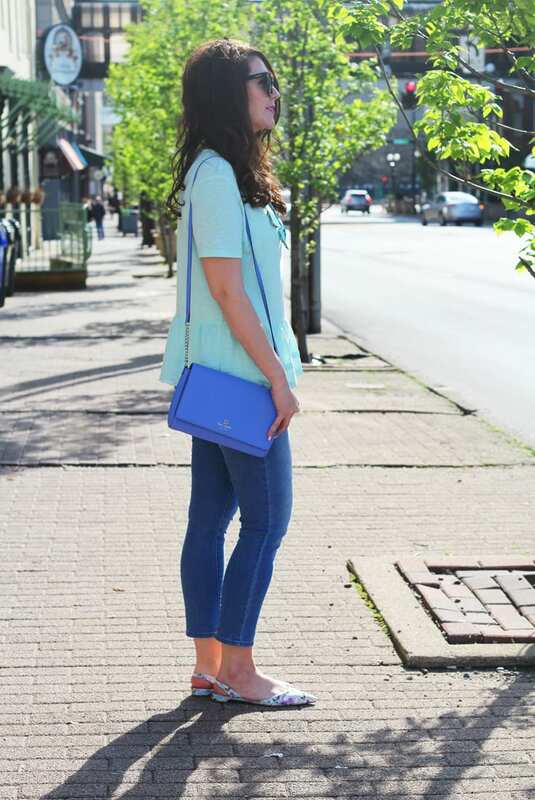 But I threw on this crossbody that totally pulled it all together! PS–through today, you can snag the flats for less than $12 with code ZZTREND! And just in case you didn’t know, Sugarfix released some new pieces at Target, including these striped earrings! The earrings definitely add a quirk to this outfit that picks up the white background in the shoes so everything comes full-circle. I LOVE that huge necklace! So cute!